As a kid (and an only child), I have to admit not feeling any special enthusiasm for holiday dinners. It was usually a long day of waiting, being polite, car rides and lots of hanging around (I’m not a football or holiday parade fan). Our tiny family didn’t have reunions of long missed cousins and relatives, so our holiday dinners were usually pretty much the same as our regular ones. Just with more food and a relish tray which was always a highlight for me. Often the quiet day after Thanksgiving was the one I really enjoyed – a fridge full of holiday leftovers to graze from all day, no pressing business, a good book and the freedom to get lost in it. I find myself wondering what Americans are really doing today? I know what we’re supposed to be doing and feeling, because TV tells me so. Frequently. And, probably not so accurately. 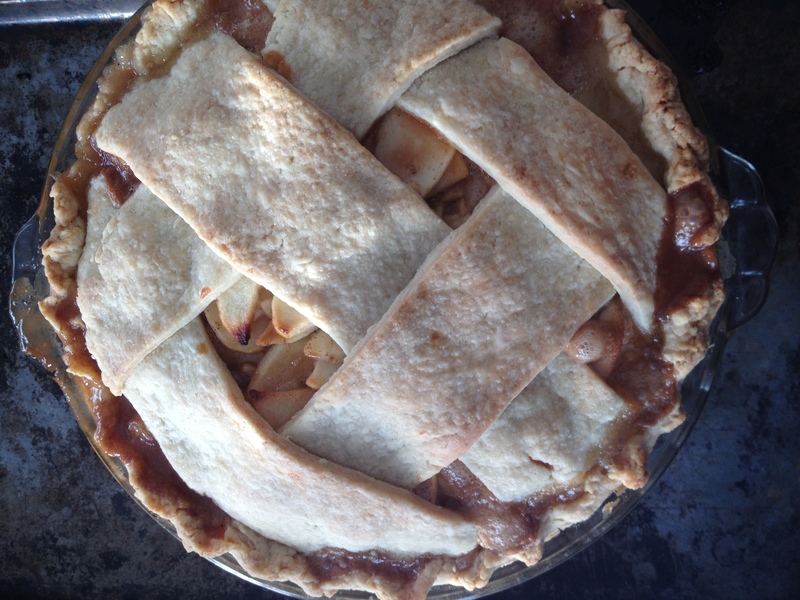 What Thanksgiving traditions are we passing on that actually have authenticity and significance? Most of us have cobbled together some hybrid of Norman Rockwell American mixed with the immigrant traditions from our own families. Throw in the latest features from popular magazines, office water coolers, TV and internet and you have an American Thanksgiving. Oh sure, if you have kids in elementary school there’s some dolled-up tales of Pilgrims and Indians and turkeys, but let’s face it – the holiday really has more to do with retail than with honoring our Pilgrim roots. Sadly, I have no idea how my great-grandmother and grandfather went about shaping their Irish lives into American ones. My family hasn’t been one to dwell on the past, but instead to adopt the modern. The old ways, old dishes, and old stories of my ancestors have vanished without a trace. Today’s “old” ways are actually pretty new, compliments of Butterball, Pilsbury, Libby’s, Jell-O and Reddi-whip. 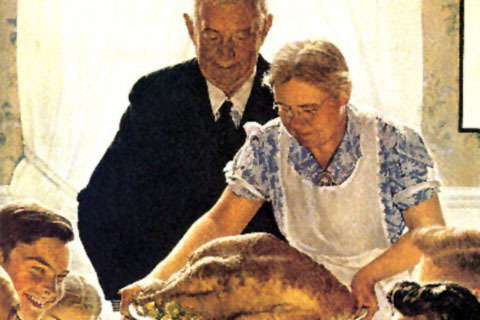 Magazines show in full color the traditional Thanksgiving we are all supposed to strive for; varnished oversized turkeys with lots of buttery, starchy side dishes and plenty of pie at the end. Now that was modern, stylish and sanitary and the inspiration for my modern career granny and her daughters as they set out to create their own version of Thanksgiving. My mother and her two sisters are good cooks who started their adult lives with no binding holiday traditions. Each cooked somewhat similar meals, with a slightly different spin created by their different life experiences and magazine preferences. Three sisters, same childhood, different Thanksgiving tables. What could be more American? I am not at all qualified to offer any factual sociological wisdom about the celebration of our national holiday, other than my fascination with people-watching and media. I can’t help but see definite Thanksgiving variations that can now be considered actual traditions for many Americans. The Food Pantry Thanksgiving two ways: Volunteer or Guest: this tradition has lots of heart-warming variations and some sobering truths we prefer not to think about most of the year. The All American Can & Jar Method: These traditions have been created by the marketing efforts of Big Food companies. Recipes featured in magazines, on the backs of cans and jars and now websites. Canned green beans and cream of mushroom soup topped with dried onions and baked. Canned yams topped with brown sugar and mini marshmallows. Butterball turkey with the pop up hickey and prepared mashed potatoes and gravy from a jar. Prepared pastry crust filled with Libby’s prepared pumpkin pie filling and topped with Reddi-whip or Cool-whip. Pillsbury crescent rolls, jello salad, and please let me be wrong about this – Stove Top Stuffing? The Store Bought All Inclusive Meal Method: all-inclusive, already cooked and ready to go. Does it come with plastic utensils too?? Am I really surprised to learn that this option is growing fast in popularity? The Restaurant Method: You don’t need me to explain this one do you? Family gets to meet in central location, split costs and no one is burdened with clean up. Beautiful in its simplicity?? Williams Sonoma Inspired: nostalgia for other people’s imagined & staged traditions. Fun for cooks, expensive and guaranteed to be completely different next year. Requires storage space for the carcasses of never to be used again appliances and gadgets. The Best of a Bad Deal Method: eating what you’ve got and feeling grateful to have it. Best when shared with upbeat friends and family and plenty of love. Can be bitter when seasoned with too much obligation and self-pity. Black Friday Focus: this one may be extreme, but this girl has been camping outside of Best Buy for days now, and plans a picnic Thanksgiving dinner in her tent… I feel myself being a bit judgmental, but really, she seems pretty enthusiastic about her holiday. Maybe I’m the one who can use an attitude tweak…. A Long, Boring Day: don’t know what to do with self because everything’s closed. If this is your tradition, thanks to Target, things are looking up. Hopefully you have a strong internet connection and the biggest shopping day of the year starts earlier all the time. A Prayerful Day of Gratitude: TV and holiday shopping don’t have much of a role in this spiritual friend and family oriented day. Menus vary. The Anti-Consumer Thanksgiving: filled with buying nothing. It can be time-consuming to not shop, so it’s a good thing you don’t have to go anywhere. Do it yourself foods of varying quality and oddity and ranges from oddball to sublime. Leads to either the ruination of America or her salvation depending on your source of news media. Did I miss any? Am I delusional? I am pretty full having enjoyed a right sized meal made from things I either bought from local farms or grew and preserved myself. Of course I still haven’t learned to make sugar yet, so I’m still leaning on the man a bit, but I’m working on it. Wherever your Thanksgiving falls along the spectrum, the important thing is that it’s YOUR holiday to be celebrated however you most enjoy it. Deliberately and with intention. Best wishes for a true holiday that’s exactly that. I guess we had a combination of the above: Anti-Consumer (you couldn’t PAY me to go to a store from Weds-Monday this week), Volunteering at the Free Community Dinner (very sobering, husband and I both needed to start drinking when we got home to stave off depression and tears about state of humanity) and a home-cooked meal with our family (Heritage breed turkey you will be happy to hear). We focused on the “giving” part of Thanksgiving this year with good results. Actually felt like the day had some meaning, as opposed to just being an excuse to spend money and pig out. It is sobering to volunteer. We seem to have segregated into communities of people like ourselves, so it’s easy to forget. I am happy to hear of your turkey – the turkeys thank you (probably not). I’m sure you made it a memorable meal. Thank you for the comment – I hope you enjoy the holiday season! Funny. Bulls I can handle, bees scare me. I’ve been thinking of finding a beekeeper to set up on my farm – I’d love to have them around, but don’t want to mess with them.